(Newser) – A minor controversy is brewing over the presidential seal and an apparent attempt to use it to adorn golf courses owned by President Trump. The problem with that idea? It might be illegal. As ProPublica explains, the Trump Organization recently ordered the manufacture of tee markers emblazoned with the seal for use at Trump golf courses—these would be the markers used to show golfers where to tee off. This became known when a metalworking and sign company known as Eagle Sign and Design posted a since-deleted photo to Facebook of the design destined for "Trump International Golf Course." (There's four such courses, and the caption didn't specify which one.) The order form seen by ProPublica and WNYC identifies the customer as Trump International. One only commits a crime under the statute by displaying the seal “in a manner reasonably calculated to convey, a false impression of sponsorship or approval by the Government of the United States or by any department, agency, or instrumentality thereof.” On Amazon, one can buy books, coffee mugs, decals, lapel pins, tees, stickers, et.al. 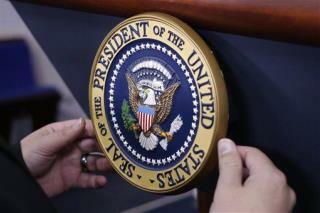 with the Presidential Seal adorning them... Apparently, near the Clintons' NY home one can buy similar stuff. and more like ashtrays..... Displaying a likeness of the seal is prohibited only when the use will create that “false impression of sponsorship or approval”, i.e., what courts in other contexts call “confusion as to source.” As one writer notes, "If we read that the uses of the seal as being either deceptive or misleading, and nothing else there shouldn't be an issue. What the Trump Organization is doing, or what Amazon is doing, or what a publisher touting a book is doing, involves uses that are neither deceptive nor misleading".